Have you ever thought that the Olympics were boring, or they were the same thing over and over again? We all love the Olympics because of one sole reason: they are ever-changing. Whether you believe it or not, the International Olympic Committee (IOC) adds around five new sports for athletes to compete in. For example, in 2016, they added golf and rugby and took out baseball, karate, squash, roller-skating, and softball. Sports can be from previous Olympics to be added back in to the next one, too. In this story, we will tell you what will be added in the new 2020 Olympics. 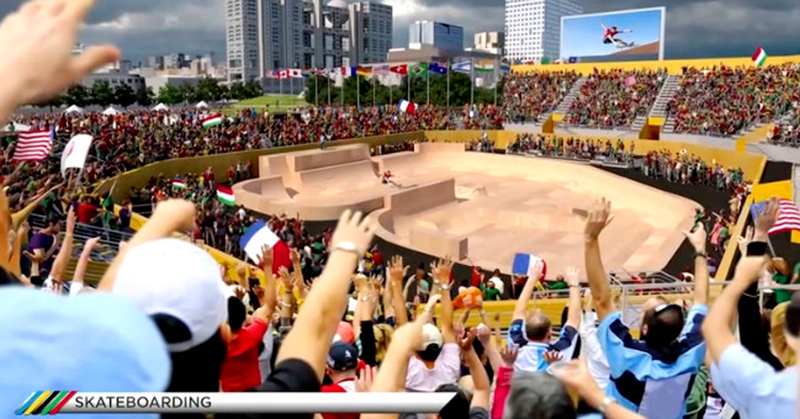 Skateboarding will also be added to the Olympics in 2020. Tony Hawk, a professional American skateboarder, is going to be one of the many people that participate in skateboarding for the Olympics. Tony Hawk got asked what he thought about the IOC adding skateboarding into the Olympics and he said, “I believe the Olympics need the ‘cool’ factor of skateboarding for their summer games.” When competing in skateboarding the athletes will be free to select which parts of the course to tackle and which tricks to do at certain times. Skateboarding will be all outdoors where it is going to take place in a “street like” park. There are about eight events and a lot of athletes participating. This is sure to be a new favorite in the 2020 Olympics. Baseball/Softball is another sport that will be played in the Olympics. You may think that U.S. will destroy all other other countries, but other places like Japan could become a real challenger. Baseball and softball has become extremely popular in the Americas and Asia, and all of these continents will probably be very dominant in baseball and softball. There is nine players on the field at a time, the teams switch off playing offense and defense. Softball is the same sport just with women instead of men. We think that the IOC took out Baseball/Softball because of steroid usage and the Olympics not checking if people were using steroids. Baseball/Softball was taken out of the Olympics in 2012, but now that the IOC has added it back we are sure it will become a great sport. . Sport Climbing is not a common sport, but it is indeed a game in the Olympics. It is a sport where you take scaling steep ascents to a whole new level. Climbers use brightly-colored hand, finger and foot holds, their climbing skills and all the strength their bodies can muster to work their way up a near-vertical wall. Speed climbing puts two climbers against each other, both climbing a specific route on a 15-meter (about 50 feet) wall. In sport climbing, there will be three different events: speed climbing, bouldering, and lead climbing. Karate will make its first appearance in the summer 2020 Olympics next year in Tokyo, Japan. There will be about 80 athletes around the world that will be participating in the summer games for karate in 2020. There will be ten competitors competing in each of the eight events. Many competitors will come from France, Spain, Italy, Germany, and Turkey as well as some others from Egypt and some in East Asia. All athletes will be playing in Nippon Budokan, which is the spiritual home of Japanese martial arts. These five games will all be exciting and fun activities for the athletes to play, and for fans to watch. On September seventh 2013 Tokyo was elected to host both the 2020 Olympics and the Paralympics. The decision to award Tokyo to host these Olympic games was greeted by an eruption of fans that were excited and ready for the 2020 Olympics. Most of these fans were in the younger age group. “The International Olympic Committee has opened up surfing and skateboarding to the Olympic Games as they are both cool, visual and exciting sports that will bring along their cool spectators and fans, and will help the Olympics stay relevant into the future.” In the 2020 Olympics they have not taken out any sports but just added five new ones. Also the Olympics might be trying to gain more attention from younger fans by adding skateboarding and surfing which seems like a younger audience would watch those sports. This is how the new 2020 Olympic games will change and what will be taken out and added. Wow, that is really cool they are adding surfing!! I can’t wait to watch! !